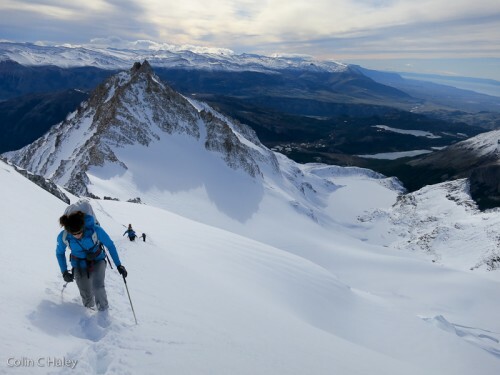 Sarah and I have been in El Chalten for a week now, and just got back to town from our second foray into the mountains. On the 20th, during a nice but very brief break in the weather, we tried to make a day-trip to Aguja Val Biois via Paso Superior. We started from El Pilar at 2:30am, and hiked to Campo Rio Blanco in rain, wind and darkness. 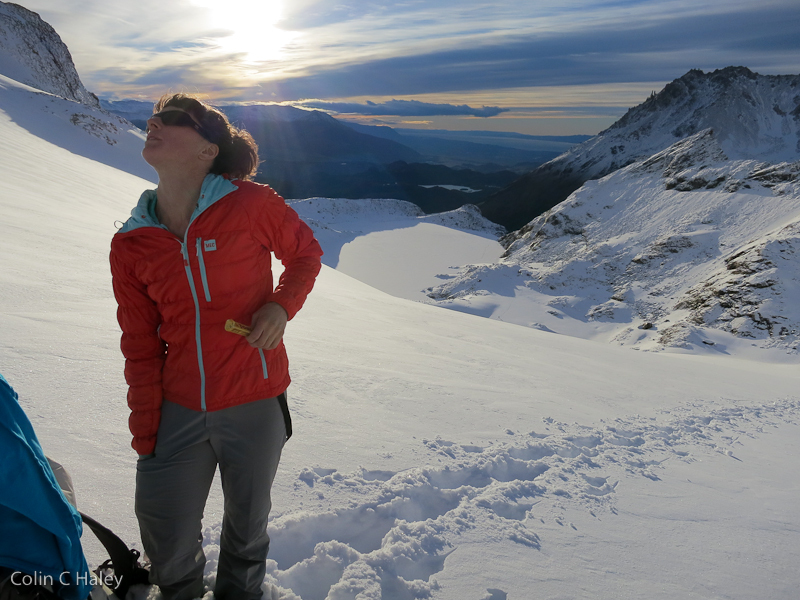 The skies finally began to clear on our way up to Laguna de los Tres, but we hit fresh snow shortly before reaching the lake. From Laguna de los Tres we started breaking trail in boot-deep snow, which soon changed to knee-deep. Past Paso Superior we started wallowing in waist-deep snow. We knew by then that we wouldn’t be going to the top of any mountain that day, but stubbornly continued, figuring that if we’d carried all our gear so far already that we might as well try to get in a few pitches. 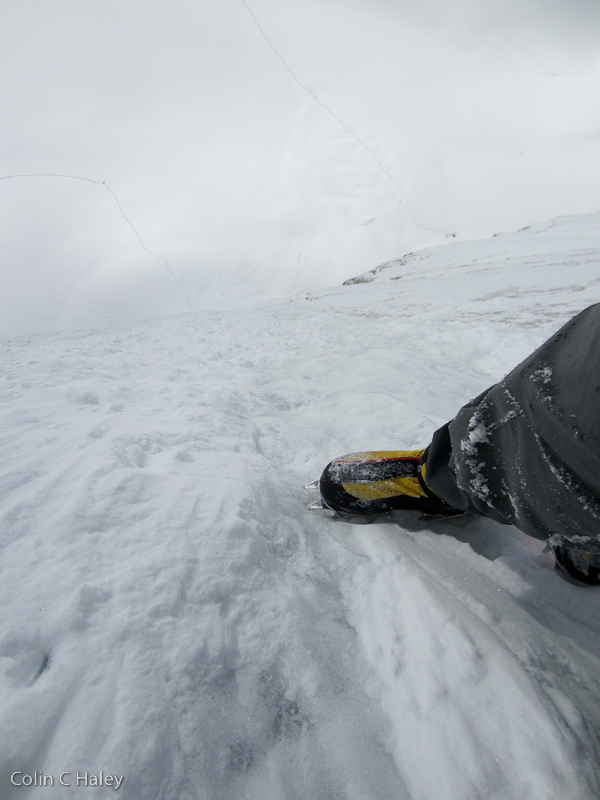 Totally exhausted from all the trail-breaking, we finally gave up in waist-deep snow, about 150 horizontal meters from the base of the wall. 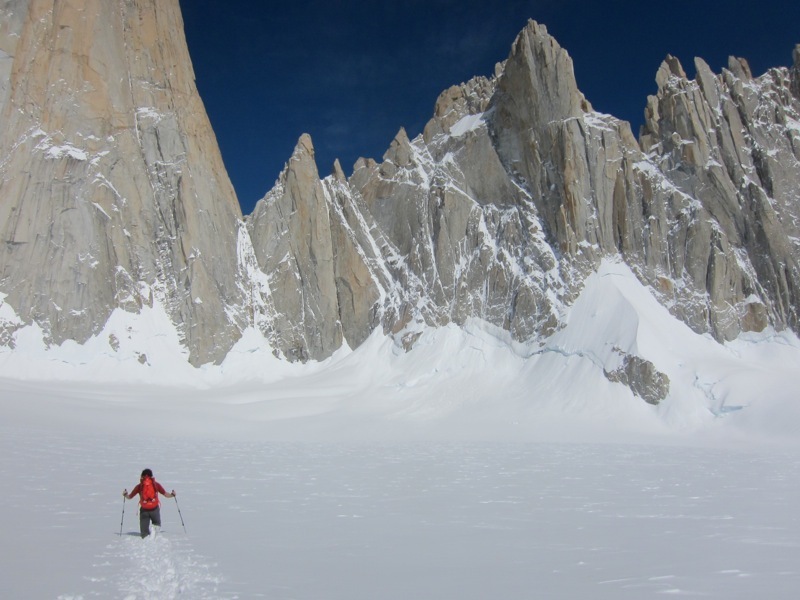 An approach that normally takes 5 or 6 hours had taken eleven – obviously we should’ve brought skis or snow shoes! The 24th was forecasted to be cold but with lower winds than the surrounding days, and we decided to have a go at Aguja Guillaumet. 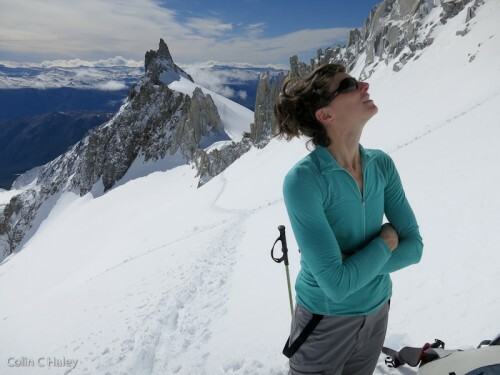 Sarah had never climbed Guillaumet before and was keen to try the Amy Route, which wasn’t that interesting of an idea to me since I’ve already done it a couple times. 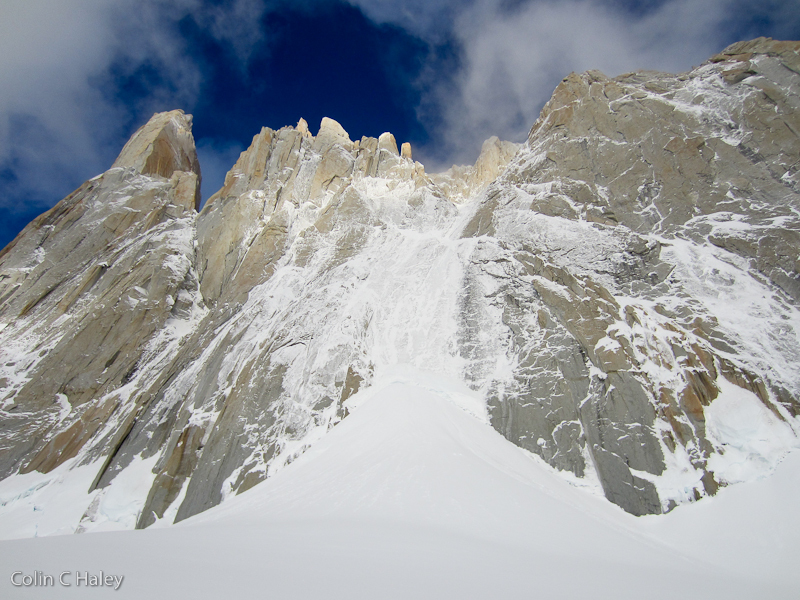 However, while approaching Aguja Val Biois, I had noticed a decent amount of ice on the east face of Aguja Guillaumet – not by any means phenomenal ice conditions (as I had seen in February 2010), but it looked like there was enough ice to consider the Beger-Jennings to be “in condition.” So, we made a plan that would be exciting for both of us: We would bring puff pants and some extra puffy jackets, so that Sarah could comfortably wait for me at Paso Guillaumet while I tried to solo the east face, and then we would try the Amy Route afterwards, with Sarah leading all of it. In the late afternoon and evening of the 23rd we hiked in to sleep about half-way up the big hill to Piedra Negra. We got a slow start on the 24th, but proceeded with the plan. I left Sarah bundled up at Paso Guillaumet, and traversed across the upper Glaciar Piedras Blancas in knee-deep snow. My plan was to start via the “Courrier du Sud” variation, and finish on the “Terre des Hommes” variation. When I finally crossed the bergschrund it was 7:37 – Way too late to be starting an ephemeral ice route on an east face in late November. Fortunately, I got lucky, and some partial cloud cover combined with the chilly temperatures to keep the route from falling apart. 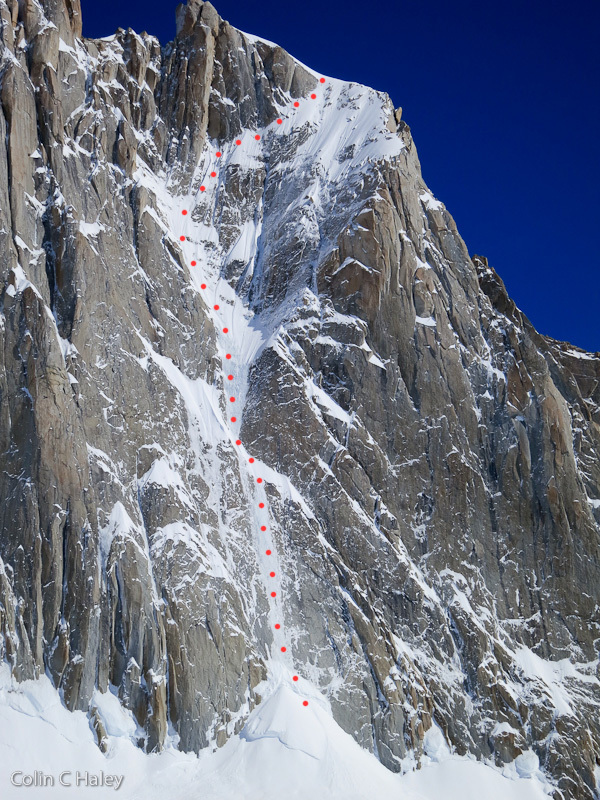 The “Courrier du Sud” variation was definitely the crux of my climb. 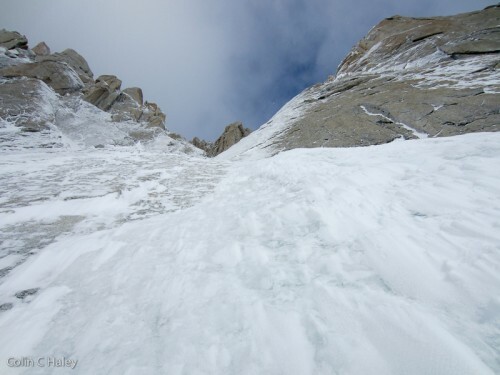 It was not very steep (never more than 75 degrees), and therefore the moves were not very difficult physically, but the ice conditions were not anywhere close to as good as I had hoped. 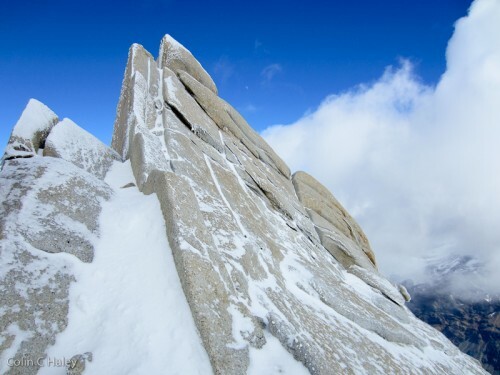 The ice was quite thin and covered in a couple centimeters of snow, making it difficult to see where there was actually ice and where there was merely a couple centimeters of neve on granite. 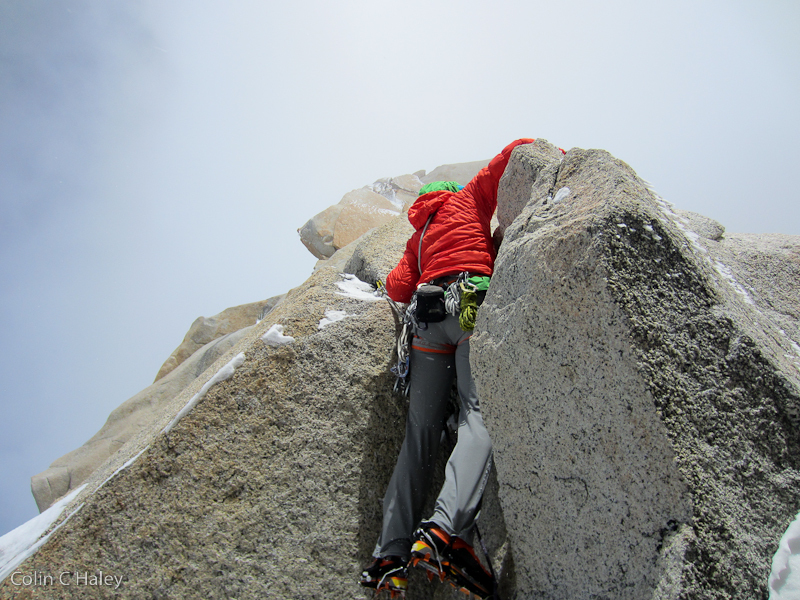 I often found myself swinging my picks into, and scraping my frontpoints on granite slab. 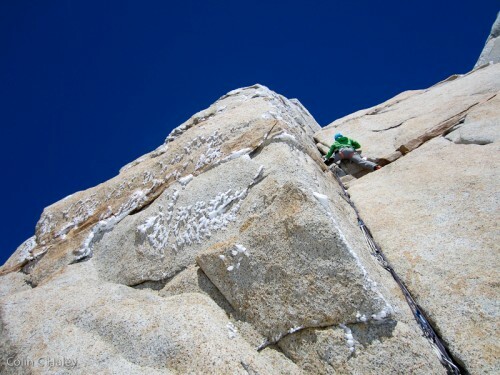 I’m embarrassed to admit that I think it was too insecure to be safely free-soloing. 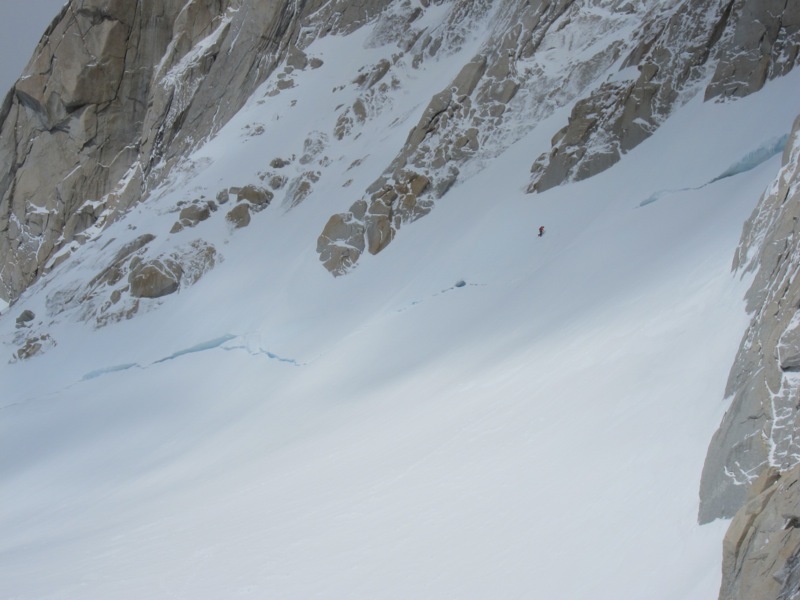 In fact, I would have bailed if I felt I could’ve, but nowhere was the ice thick enough or high-enough quality to place a short ice screw, let alone make an Abolokov anchor, and down-climbing seemed too sketchy with such delicate conditions. I was quite relieved to make it through the “Courrier du Sud” variation and join up with the original Beger-Jennings line, which was easy through the middle part of the face. 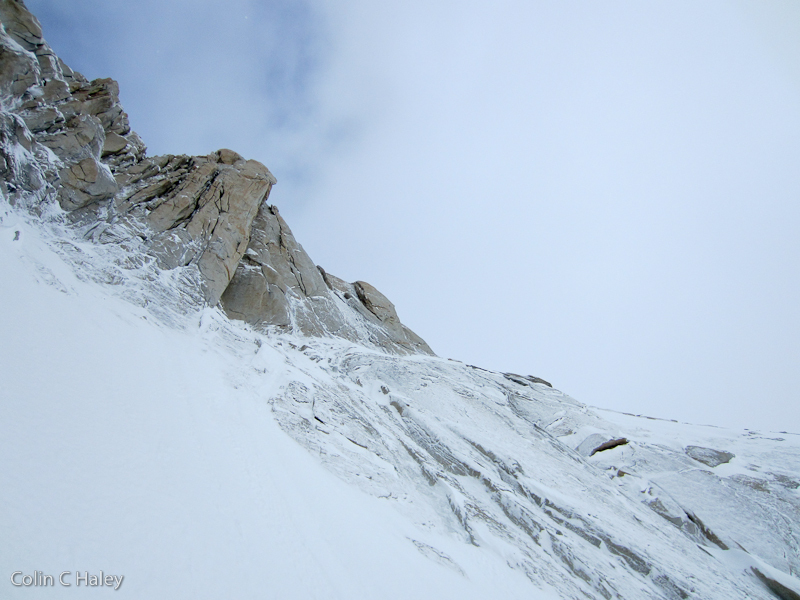 Upon close inspection, the “Terre des Hommes” finish looked much worse than it had from far away – much less solid ice and neve, and much more unconsolidated snow straight on rock. 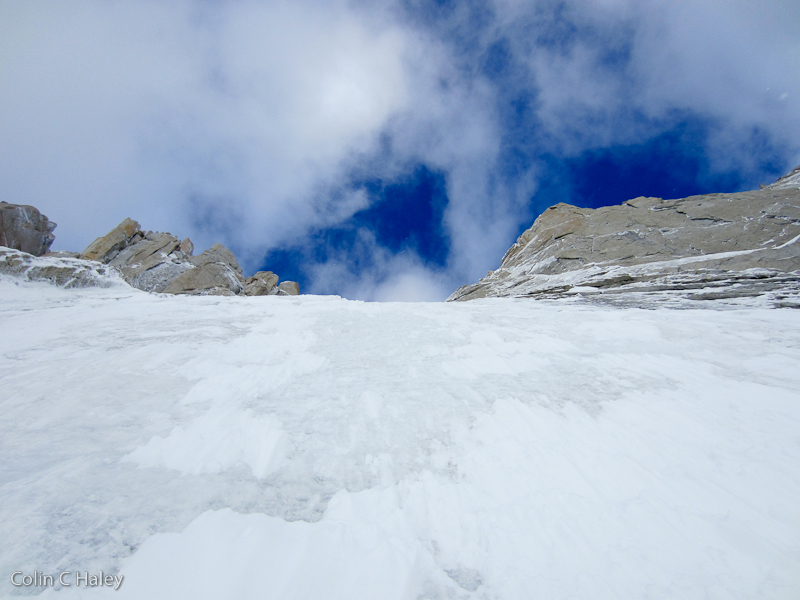 However, expecting an easy romp up solid ice and snow, I had brought very minimal hardware (60m of rappel cord, 4 pitons, 4 screws and a few stoppers), and bailing seemed like an option unlikely to work out well. I took a lot of care through the worst bits of the “Terre des Hommes” variation, and before too long was walking up Guillaumet’s summit snowslope. 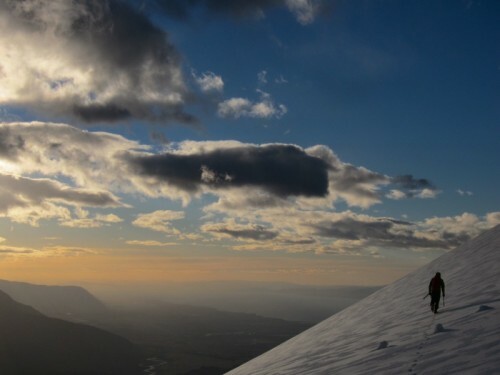 I reached the summit at 9:43, 2 hours and six minutes after crossing the ‘schrund. 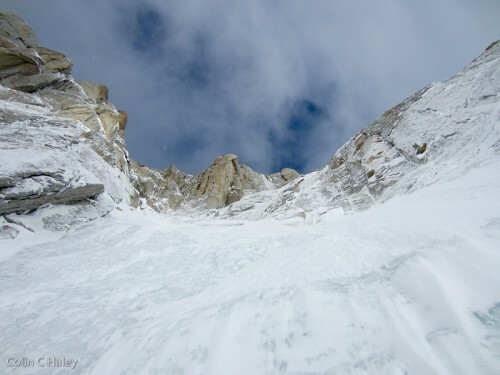 Due to the lean conditions the ascent had unfortunately passed beyond what I consider safe, but of course the stress soon drained away upon joining the safety of Guillaumet’s well-travelled voie normale. 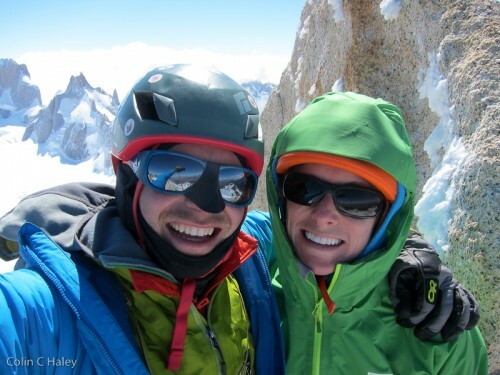 I made a straightforward descent via the Amy Route, downclimbing some of the couloir since I had only 60 meters of rope, and was joining Sarah for lunch at Paso Guillaumet just after eleven. After lunch Sarah and I started back up the Amy Route at noon. It was Sarah’s first time climbing an ice and mixed route, and she did a great job leading it all. 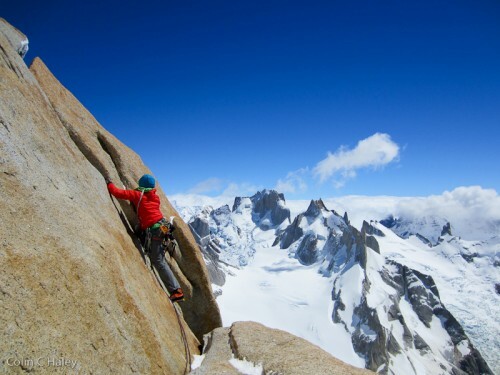 In the cold and snowy conditions there was no chance for her to put on the rock shoes she had brought, and she only even removed crampons for the crux 5.7 dihedral. We reached the summit at 3:50 – Sarah’s first time on Aguja Guillaumet, my tenth and second for the day! The descent was easy, and we hiked out the next morning, stoked on a good start to the season. Although the conditions weren’t as good as I’d hoped, I did think that the Beger-Jennings was a cool route, and one that I’d recommend when in better condition. It is a bit like a slightly easier, slightly shorter version of Le Ginat on Les Droites. Colin beginning the trail breaking, just above Laguna de los Tres. Photo by Sarah Hart. Sarah taking a quick break from the wallowing, en route to Paso Superior. Sarah just above Paso Inferior. Sarah traversing below Punta Velluda, en route to Paso Superior, with a team of Slovene climbers coming up to take a turn with the trail breaking. Sarah taking a break from the wallow-fest just above Paso Superior. 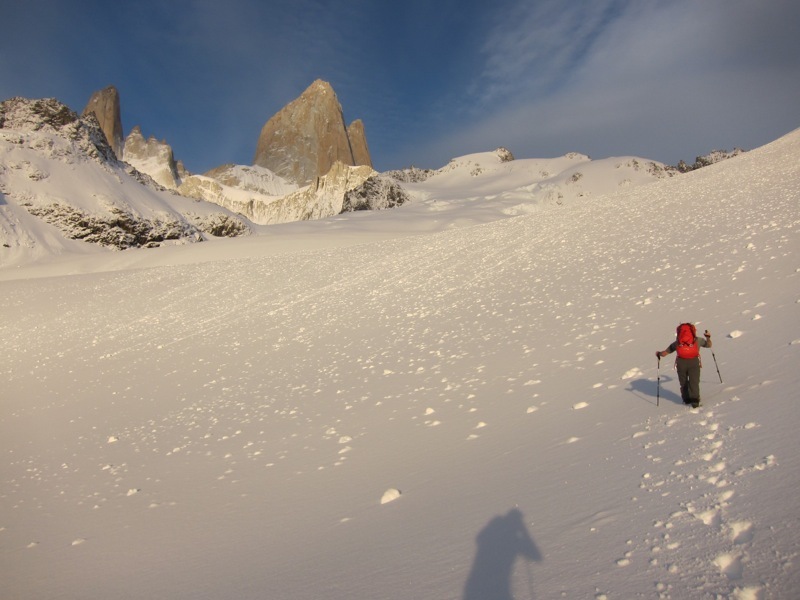 Colin wallowing on the upper Glaciar Piedras Blancas. Photo by Sarah Hart. The east face of Aguja Guillaumet on the 20th, showing the line I climbed on the 24th. 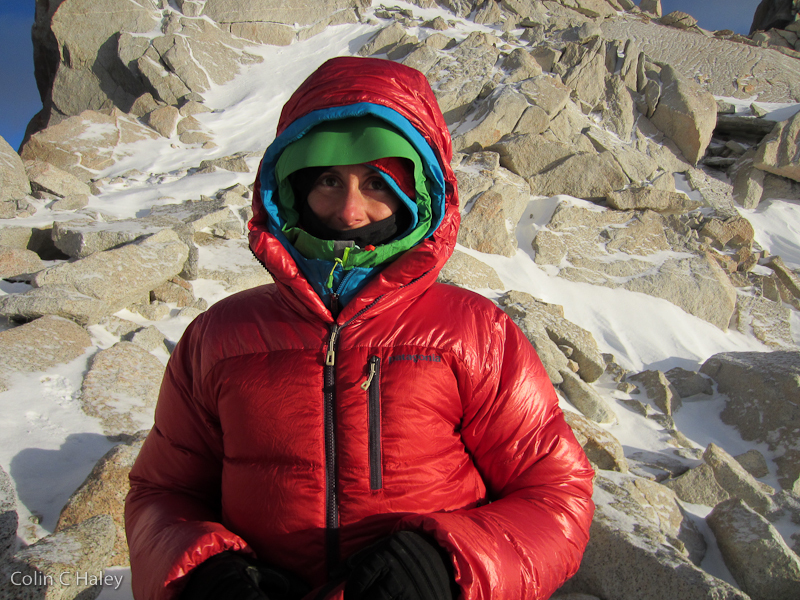 Sarah all bundled up and cozy at Paso Guillaumet. 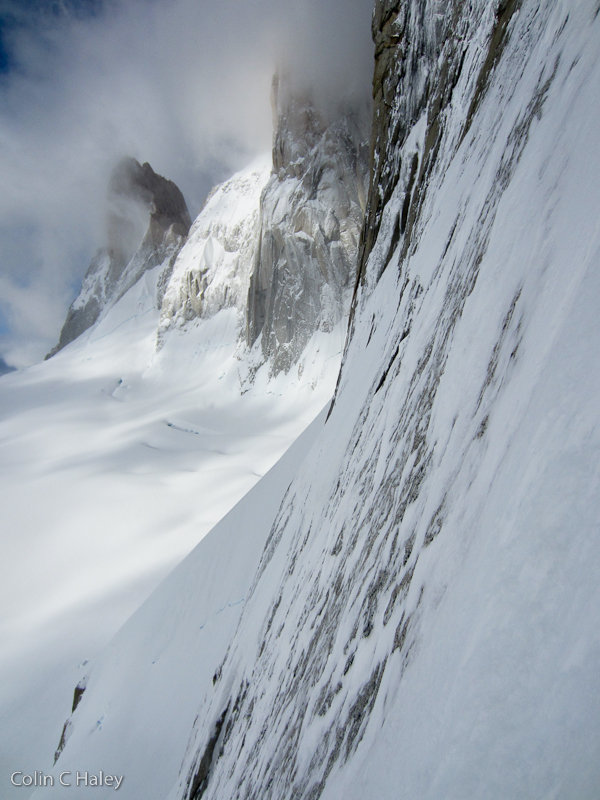 Colin heading out from Paso Guillaumet to approach Guillaumet’s east face. Photo by Sarah Hart. Looking up the Beger-Jennings route from near the base. 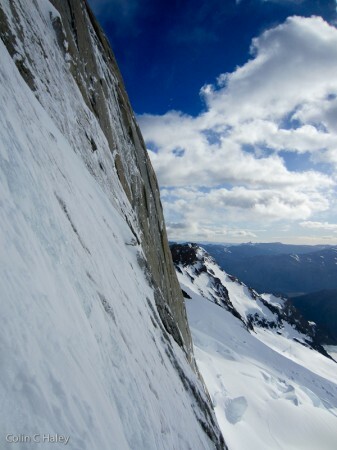 Looking up from the bergschrund. Above the sketchy bits of the “Courrier du Sud” start, and finally able to relax a bit and take a photo. Better, thicker ice near the junction with the original Beger-Jennings line. Looking north from near the junction with the original Beger-Jennings line. Looking south from near the junction with the original Beger-Jennings line. Fat, nerve-calming ice on the middle section of the Beger-Jennings route. 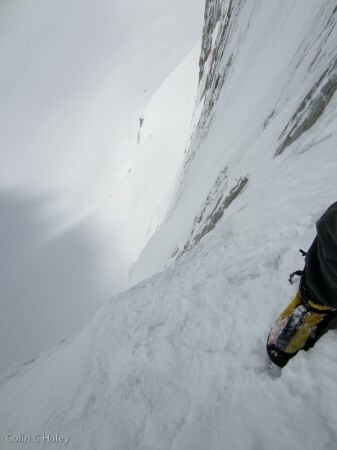 Looking down from about midway up the face. 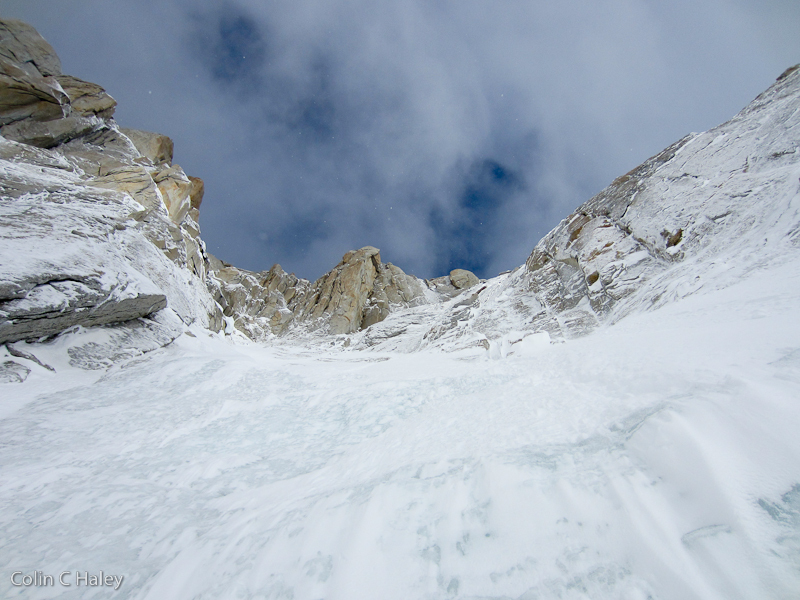 Looking up at the “Terre des Hommes” finish, which traverses right below the steep rock wall. Looking down from near the end of the “Terre des Hommes” variation. 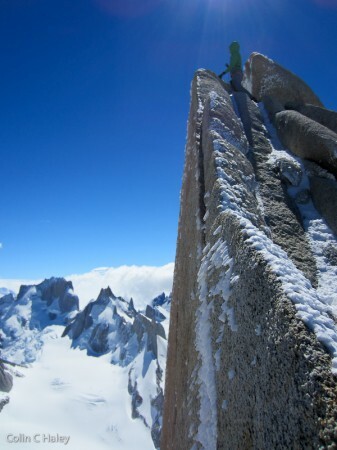 The summit of Aguja Guillaumet. On top of Aguja Guillaumet for my ninth time. 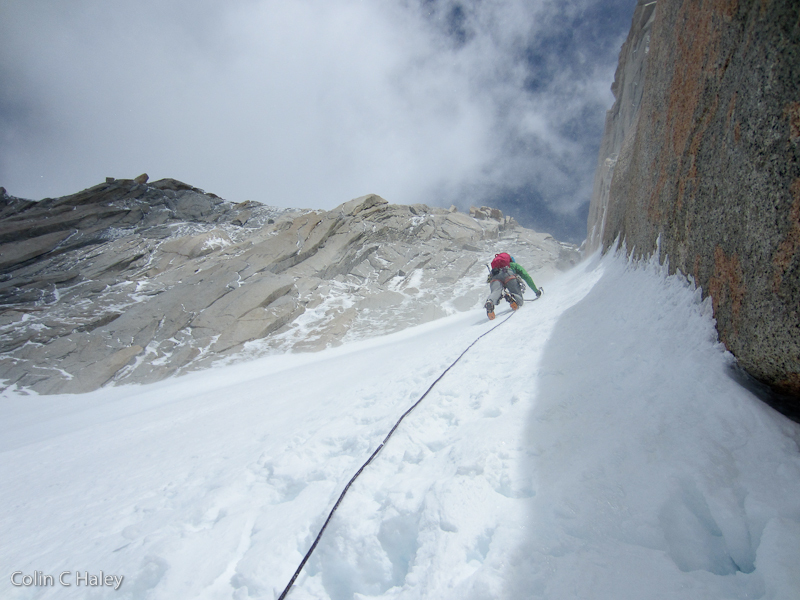 Colin down-climbing over the bergschrund at the base of the Amy Route. Photo by Sarah Hart. Sarah starting up the Amy Route just after noon. Sarah starting up the first rock pitch, at the junction with the original Comesaña-Fonrouge route. 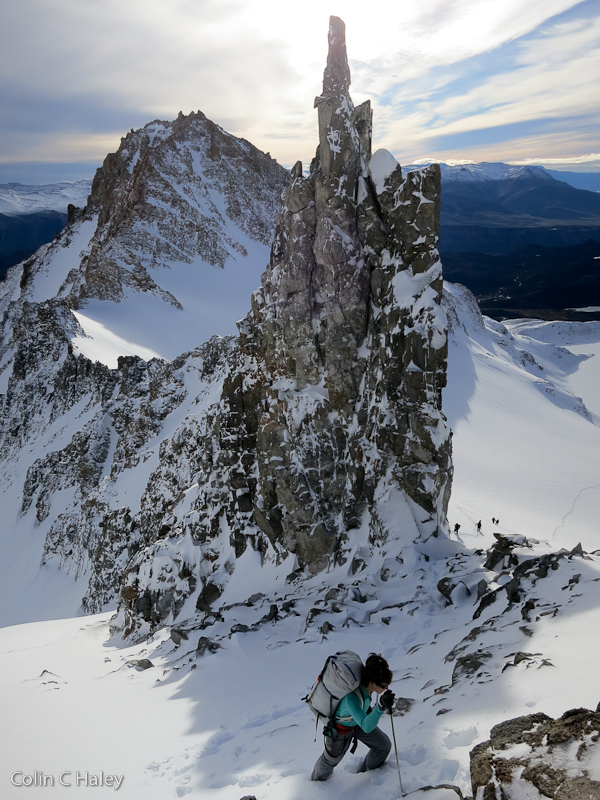 Sarah climbing the upper part of the Comesaña-Fonrouge, with Torre Piergiorgio and Cerro Pollone behind. 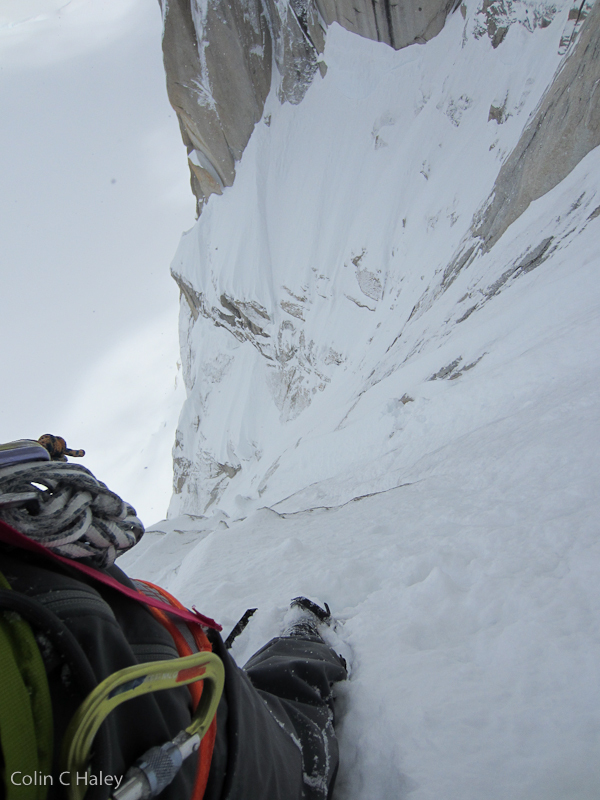 Sarah on the crux pitch of the Amy Route – a 5.7 dihedral that feels much more difficult when snowy and wearing boots. Sarah’s first visit to the summit of Aguja Guillaumet. 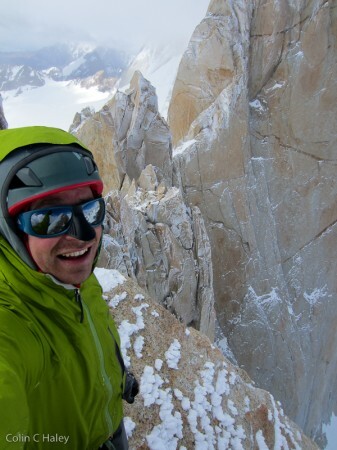 Happy times on top of Aguja Guillaumet! 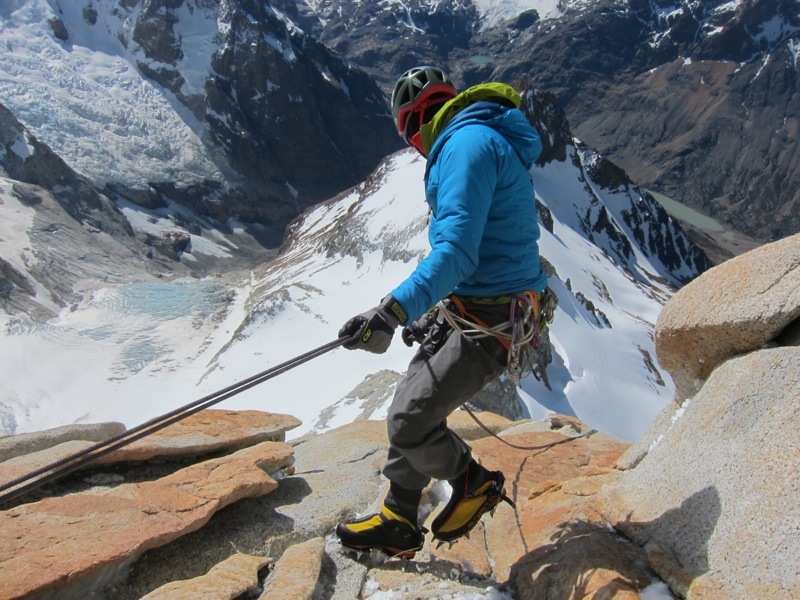 Colin rappelling on the upper part of the Comesaña-Fonrouge. Photo by Sarah Hart.